Speaker wires strung around a vineyard can cause problems when over-row spraying is done. 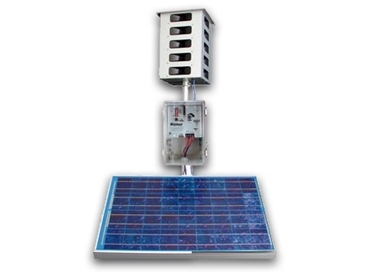 Pro Amp bird control devices are designed to replace several small-sized units. Since sound cannot travel efficiently through dense vegetation, the speakers must be placed about three feet (1m) above the top of the foliage. Correct installation is very important. Bird Gard will provide a mud map indicating the best position for the Pro Amp to be placed. Pro Amp bird control devices are user-friendly in design and all modes of operation are clearly marked on the face of the sound generator unit. Electronic bird control aims to keep a majority of birds out of crops at a vastly lower cost than netting. An occasional spray with electrical contact cleaner over the connection points and switches will ensure years of trouble-free operation.